We at Sable Aviation feel privileged to provide fixed-wing aircraft charter service to Sable Island, a delicate crescent of sand located 300 km south-east of Halifax, NS. Sable is approximately 42 km long and 1.5 km wide at its widest point. Since there is no airstrip on the island, our BN-2A Britten Norman Islander aircraft lands on the sandy expanse of the island's south beach. 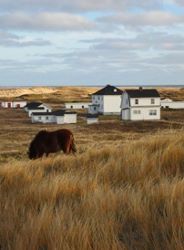 Sable Island is a National Park Reserve, so Parks Canada has sole control over approving and scheduling visitor flights, as well as arrivals by sea. For information and approval on timing for a visit, please consult the Parks Canada web site. After Parks has approved your visitation date, they will inform us of your booking. We would appreciate an e-mail from you with your day-of-flight contact information, so that we can reach you in the event of any flight delays. We also need to know the number of people in your group and your method of payment. The major hurdles for visiting Sable are weather and beach condition. There are many factors that come into play with regards to weather, and the beach itself must be firm, with an area of suitable length and orientation to the wind. The runway information will be conveyed to the pilot by the Parks Canada Operations Coordinator on the day of the flight prior to departure. Often there may be no suitable landing area, or the weather may prohibit a flight. For this reason, it is generally a good idea to contact us before leaving for the airport. If you have questions on the number of passengers, cost, best time of the year to travel, or other trip information, please refer to the Frequently Asked Questions (FAQ) page. Occasionally, individuals are looking for others with whom they can share a flight. If this is of interest to you, check out the Facebook group Sable Island Aircraft Charter.